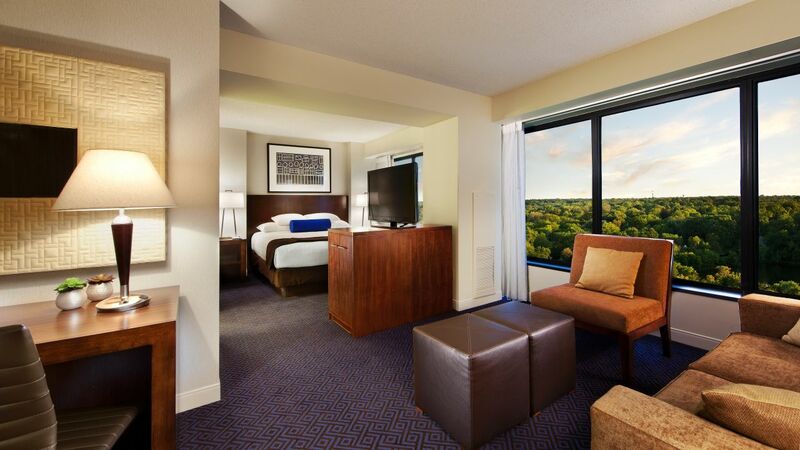 317 suite-sized guest rooms with views of the city or Morton Aboretum. Enjoy spectacular panoramic views of the Morton Arboretum and city from these suite-sized 520 square foot Naperville accommodations. Warm contemporary décor complements separate sitting and work areas and rich amenities, including a deluxe bath with KenetMD™ bath products. Enjoy wireless Internet access, video-on-demand, data port, video checkout, cable / satellite channels, dual-line speakerphone with voicemail. Relax upon a king-sized Grand Bed™ featuring ultra-plush pillows, the softest of sheeting and thick down blanket, all piled atop an irresistible pillow top mattress. An iHome stereo with iPod® docking station offers pleasant diversions. Treat yourself to luxury in our Illinois accommodations with the convenience of 24 hour Concierge, an a fax machine in 12th floor rooms. Effective March 1st: Credit Cards will be required for all guests upon check in. Cash will be accepted however, a Credit Card must be available for incidentals. This is a standard suite. See World of Hyatt program terms for upgrade eligibility. Immerse yourself in the lavish comfort of these suite-sized 434 square foot accommodations with a panoramic view of the Morton Arboretum or Naperville. Enjoy the warm contemporary décor featuring separate sitting and work areas, a sleeper sofa and fine furnishings. Rich amenities include wireless Internet access, KenetMD™ bath products, dual-line speakerphone with voicemail and 24 hour Concierge. Stay entertained with an iHome stereo with iPod® docking station, cable / satellite channels, video-on-demand. Relax upon one King Hyatt Grand Bed™ fitted with ultra-plush pillows, the softest of sheeting and thick down blankets, all piled atop irresistible pillow top mattresses. Reward yourself with these fine accommodations in our luxurious Illinois accommodations. Effective March 1st: Credit Cards will be required for all guests upon check in. Cash will be accepted however, a Credit Card must be available for incidentals. 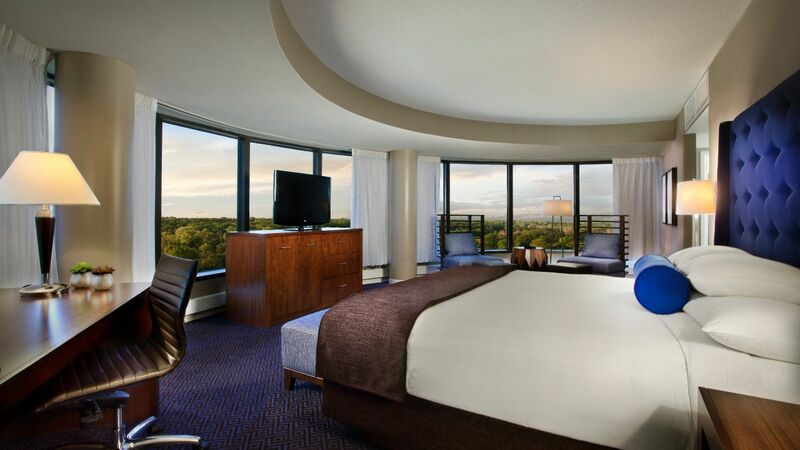 Immerse yourself in the lavish comfort of these suite-sized 434 square foot accommodations with a panoramic view of the Morton Arboretum or Naperville. Enjoy the warm contemporary décor featuring separate sitting and work areas, a sleeper sofa and fine furnishings. Rich amenities include wireless Internet access, KenetMD™ bath products, dual-line speakerphone with voicemail and 24 hour Concierge. Stay entertained with an iHome stereo with iPod® docking station, cable / satellite channels, video-on-demand. Relax upon two Double Hyatt Grand Beds™ fitted with ultra-plush pillows, the softest of sheeting and thick down blankets, all piled atop irresistible pillow top mattresses. 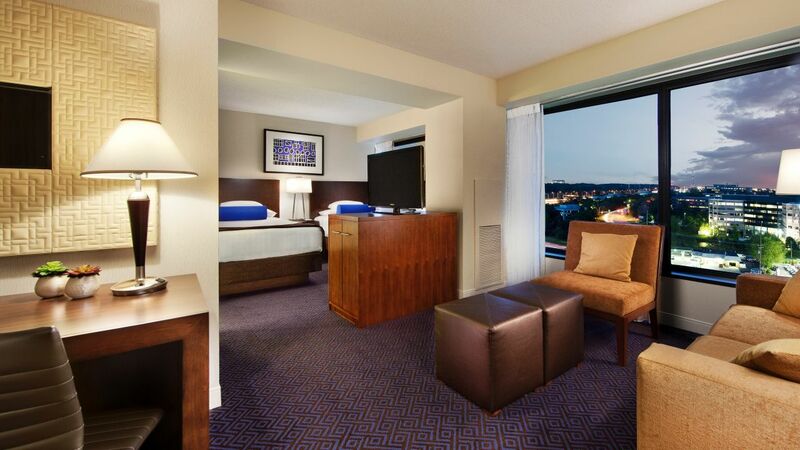 Reward yourself with a stay in our luxurious Illinois accommodations. Effective March 1st: Credit Cards will be required for all guests upon check in. Cash will be accepted however, a Credit Card must be available for incidentals.